Fennel is a vegetable, spice, and herbal medicine all wrapped into one, offering a versatility that belies its invasive plant status. Hailing from the Mediterranean Basin, fennel may now be a familiar sight on coastlines and plains across the world, but behind it there is a long history of human use that spans from stem to seed to flower, mainly due to fennel's pleasant aroma, which has lent itself to culinary feats for centuries, but also to its long list of medicinal benefits. Restoring hormonal balance. Fennel stimulates the production of estrogen in the body, thus helping relieve premenstrual syndrome (PMS) and menopause symptoms. Promoting digestion. 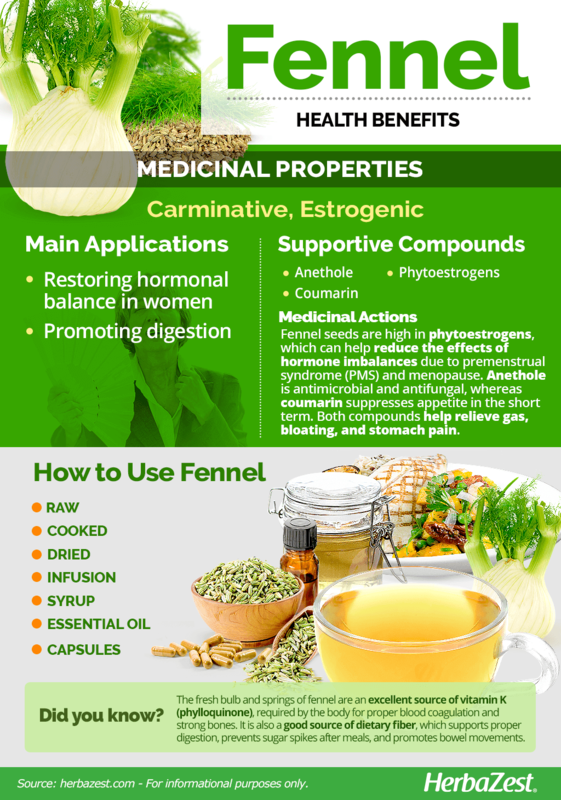 The carminative properties of fennel aid digestion, preventing abdominal bloating and gas. Fennel medicinal properties are also able to lower high blood pressure. The fennel plant has been traditionally used for treating infant colic and respiratory problems. Fennel seeds are particularly high in phytoestrogens, but also contain two main bioactive compounds: anethole, which provides antimicrobial and antifungal power, and coumarin, which suppresses appetite in the short term. Folk medicine has long used fennel for treating eye conditions such as glaucoma, and scientific research supports its potential in this area; however, the most widely used fennel properties are carminative, with the purpose of relieving flatulence and other digestive issues, like stomach pain and bloating, and expectorant, in order to clear the airways during asthma attacks and respiratory infections. Menopausal women particularly benefit from the phytoestrogenic compounds in fennel, which can help replace dwindling estrogen levels, thus reducing the unpleasant side effects of hormone imbalance. Some research suggests that fennel may be effective in treating hypertension and aiding weight loss. Other herbs with carminative properties are cloves and rosemary, while anise and dong quai also have estrogenic actions. Fennel seeds are toxic in large doses, so the suggested dosage should not be exceeded. Fennel essential oil should never be taken orally and must be properly diluted before topical application. Pregnant women, breastfeeding women, and small children should not take medicinal preparations of fennel. 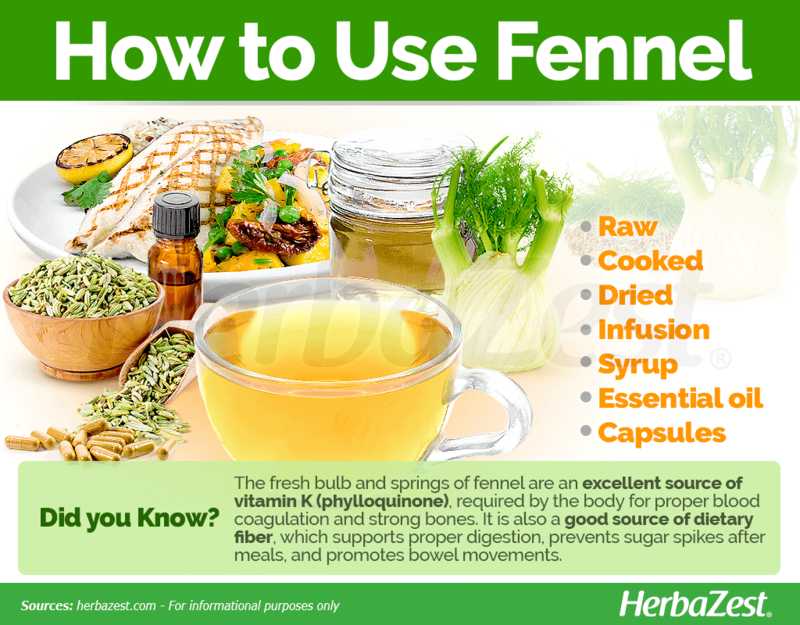 The fresh bulb and springs of fennel are an excellent source of vitamin K (phylloquinone), required by the body for proper blood coagulation and for promoting strong bones, which have been linked to a reduced risk of fractures. On the other hand, fennel provides good amounts of vitamin C (arcorbic acid), enough to help promote immunity and proper iron absorption. Fennel bulbs are also a good source of dietary fiber, which supports proper digestion, helps reduce sugar spikes after meals, and promotes regular bowel movements, making of this vegetable a great option for diabetics and people who suffer from constipation. Adequate amounts of many important minerals can also be found in fennel, mainly potassium, manganese, and copper, as well as B-complex vitamins and vitamin A. 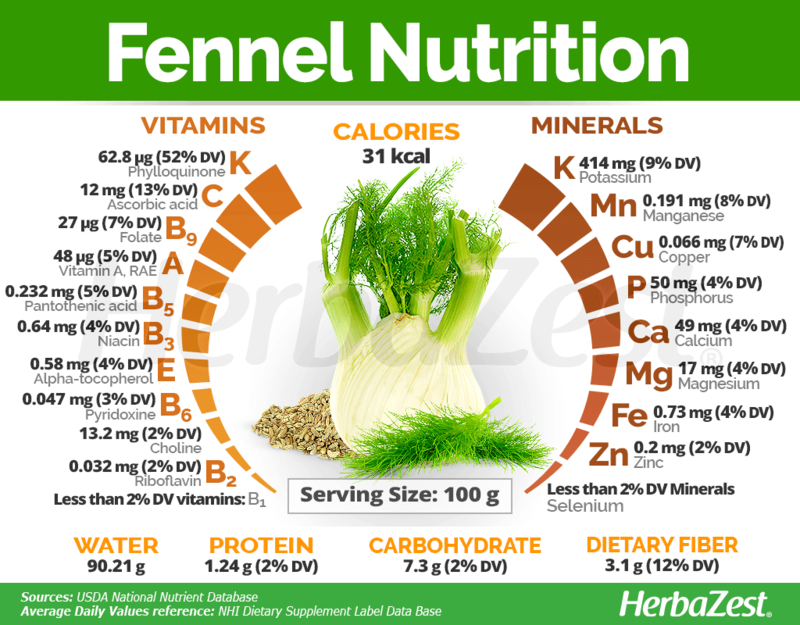 100 grams of fresh fennel provide 31 calories, as well as 2% of the daily value for proteins and carbohydrates, and 12% DV of dietary fiber. The best way to reap fennel health benefits is consuming the herb in medicinal forms. Medicinal preparations are typically made from the seeds or fruits. However, all parts of the fennel plant are edible. They have a crisp texture and sometimes licorice-like taste, and are used for culinary purposes. Raw. The hollow stems and leaves of the fennel herb are commonly eaten raw in salads, especially in Italy. The carminative properties of Foeniculum vulgare can be reaped even when it is used in culinary amounts. Cooked. Roasted, grilled, or boiled, alone or with other vegetables, fennel bulbs can add nutritional value and flavor to a myriad of dishes. In this form, fennel also provides its digestive, carminative benefits. Dried. The dried seeds of fennel are most commonly employed for seasoning in larger dishes, though they are sometimes eaten raw. The bulb and leaves are sautéed, stewed, or grilled as a side in mainstay dishes. Infusion. Fennel seeds can be stepped in hot water for few minutes, in order to obtain a warm beverage that can be taken to soothe the symptoms of premenstrual syndrome (PMS) and menopause. Syrup. When boiling the crushed parts of the fennel plant with water and honey, or sugar cane, a thick preparation is obtained, and can be taken by spoon in order to relieve indigestion and the symptoms of premenstrual syndrome (PMS). Essential oil. 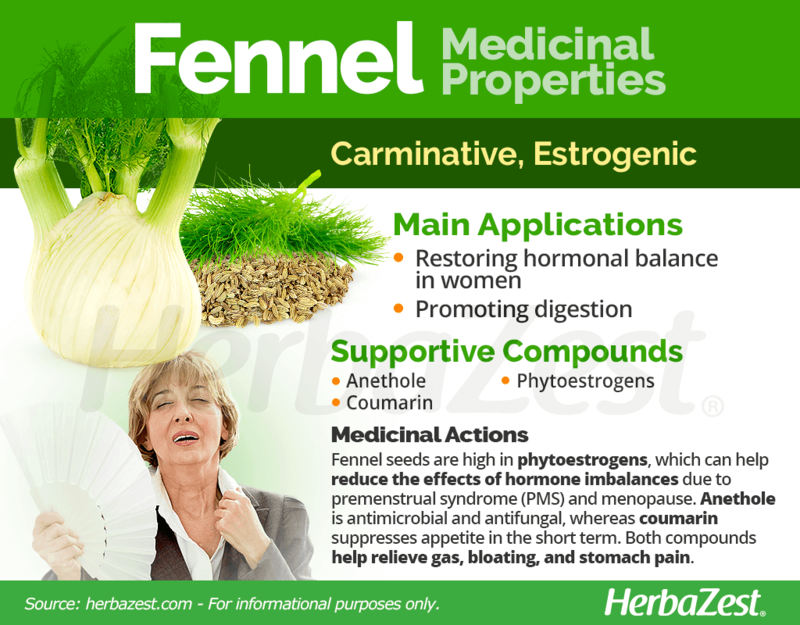 Fennel essential oil provides carminative, antiseptic and estrogenic effects. It must be properly diluted before being consumed for relieving gas, indigestion, or premenstrual discomfort, and it can also be applied topically to soothe minor skin irritations. Capsules. This supplemental form of Foeniculum vulgare makes easier to manage dosage and intake levels, specially for treating hormonal imbalances. In culinary terms, fennel is generally considered a fall and winter vegetable, and fresh versions of the Foeniculum vulgare may be easier to find at farmers' markets and grocery stores during these seasons. The dried fennel seed, however, is a common seasoning found in major supermarkets worldwide throughout the year. To grow the plant for the benefit of all its parts, whole specimens can be found in garden stores during cultivation seasons. Fennel supplements can be found in many specialized health food stores, as well as through some wholesale retailers and several different outlets online. Often, they are found as a seed extract, as this part of the herb contains higher concentrations of its medicinal elements. Capsules are also widely available through online retailers, and offer the benefits of fennel in standardized doses. Fennel is an annual herb, favorite among amateur gardeners for its easy and rapid cultivation. However, it is recommended not to plant fennel alongside species like tomatoes and beans, as it may inhibit their growth. When left on its own, the fennel plant will grow as a perennial, but it is usually cultivated as an annual, since harvesting it ends the plant's life cycle. Because of its invasive nature, many prefer to isolate fennel's growth to specific areas. Full sun is preferable, but some shade is advised in the hottest months of summer. Fennel seeds should be planted after the last frost, 10 inches (25 cm) apart to avoid damaging transplants and competition between plants. Harvesting is possible approximately 12 weeks after planting, when the fennel bulb is about the size of a tennis ball. Fennel (Foeniculum vulgare), also known as sweet fennel, is a plant that stands an average of five feet (1.5 m) tall on hollow stems and has fine, feathery leaves. Yellow flowers are produced on a single umbel, or rib-like structure that radiates from a single point. The small seeds are ovular and grooved. The fennel plant is easily mistaken for poison hemlock, which can be dangerous for those harvesting from the wild. Fennel (Foeniculum vulgare) is a member of the large Apiaceae botanical group, and one of the 3,700 species comprised within this family of aromatic plants, boasting close ties with anise (Pimpinella anisum), carrot (Daucus carota), and celery (Apium graveolens). There are several different cultivars of fennel, but two main groups exist in widespread cultivation. Florence fennel (Foeniculum vulgare var. azoricum) is the most populous and widely cultivated, recognizable for its sweet, aromatic flavor that is similar to anise, though stronger in scent. Its counterpart, bronze-leaved fennel (Foeniculum vulgare 'Purpureum'), is used more frequently as a decorative or ornamental plant, as opposed to a food product or herbal medicine. The first written records of the fennel herb belong to the ancient Roman historian Pliny, who lived from 23 - 79 BCE and credited it as an herbal remedy for 22 different conditions. Foeniculum vulgare was likely plentiful long beforehand, however, as the ancient Greeks featured it in mythological tales and were later known to call it marathon due to its wild growth on the field where the famous battle of Marathon was fought. The Middle Ages saw the fennel's migration throughout Europe as an appetite suppressant and fighter of evil spirits, and it was brought west with Puritan pilgrims for religious fasting purposes. Particularly valued in Italy and Greece, the fennel plant has been naturalized in northern Europe, Asia, North America, and Australia. In the latter two, it is now considered as an invasive weed. Despite its prevalence in the wild, fennel is also cultivated as a spice crop in many parts of the world, chiefly for its seeds and essential oils, which are used in several different industries. India is responsible for the majority of the world's fennel production, having generated over 58,000 tons in 2011. Most of this is consumed within the subcontinent itself, but the fraction that is exported still results in $10.7 million USD per year. Other countries with high yields include Turkey, France, and Germany. Gardening. Fennel's primary uses remain nutritional, but it is also grown widely as an ornamental element in temperate-climate gardens for its bright color and sweet fragrance. Insects' repellent. The fennel plant is thought to be disliked by fleas, and a powdered version of the herb is sometimes used as a home remedy for keeping the insects away from pets. Alcohol industry. Fennel flowers are the most potent and expensive part of the plant, and they are known to be one of the ingredients used in the preparation of a liquor called absinthe, to which soothing and hypnotic properties are attributed. Breath refresher. 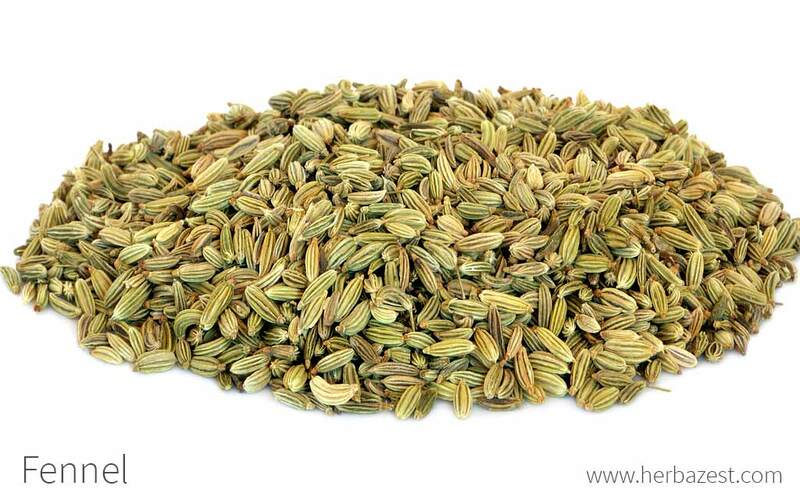 Many parts of India and Pakistan are known to roast fennel seeds to freshen breath after meals.